A wide range of innovative and sustainable products and applications has always been only one part of CHT's philosophy. We want to be a competent partner and consultant to all participants in the textile market and have been offering comprehensive support along the entire textile production chain for more than 65 years. Today we are a leading company for sustainable applications and processes. We are working on advising and supplying our customers even more effectively every day, also with our Brand & Retail Service. Comprehensive counselling is a decisive success factor. Especially in the textile industry, requirements and processes are becoming increasingly demanding and complex. Not only laws and institutions are more and more demanding regarding transparency, there is also an immense consciousness on the part of the consumers regarding the absence of harmful substances and product safety. More and more product components and production processes have to be supported by verifiable labels or certifications. Bluesign®, GOTS, ZDHC and other institutions are thus increasingly influencing all textile processes and leading to an increase in global control and stricter conditions. Therefore, partners who are at your side with words and deeds are all the more important. The CHT Brand & Retail Service is here your eye to eye specialist in chemistry. We support you in complying with and implementing ecological basic conditions and advise you with regard to technical and economically sensible implementation. We support consumers, customers, brands but also NGOs, testing institutes and associations by creatively cooperating on the basis of our knowledge, our ideas and tailor-made solutions. Due to its extensive networking, knowledge of the textile market and high process know-how, the CHT Brand & Retail Service is your perfect bond to the finishing company, but also to the merchandiser, the retailer and the brands. Everybody knows these situations: You are mountain hiking and suddenly a rain shower comes up and the rain jacket lets through. After just a couple of washes, your favourite sweater has lint everywhere and no longer feels soft. The new yoga pants were only used a little and yet they are already out of shape. The expensive running shirt leaves an unpleasant feeling in summer, because the sweat is not properly transported to the outside. Textiles literally surround us around the clock. We don't just wear them on our bodies, we also live and work in them. No matter how active we are, our textiles have to go through a lot and have to provide top performance permanently and reliably. Functionality, durability and wear comfort are indispensable. 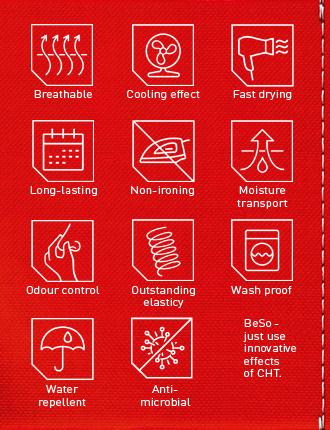 With the "Best Solution" concept, BeSoEFFECTIVE, the CHT Group offers an ultra-modern and powerful range of effects that provide textiles with high-quality properties. Depending on the field of application, the innovative effects can be used individually and meet the highest demands in terms of performance and sustainability. BeSoEFFECTIVE | Smart effects with character.